Putting a dash of blackcurrant in a pint of stout was a tradition I was introduced to when I first started drinking. I wasn’t a stout drinker initially (it took several gigs at the Guinness Storehouse with only the black stuff on offer to change that!) but the blackcurrant cordial was proffered as a way of sweetening the dark bitterness. I stuck to the light, quaffing pints of a macro-brewed lager that sponsored most of our college events. Couldn’t touch the stuff now. But I still have a weakness for that combination of stout and blackcurrant and I’ve been playing around with it this week. The first iteration, a brace of chocolate, stout and blackcurrant loaf cakes went down well at the brewery but I knew I could do better. 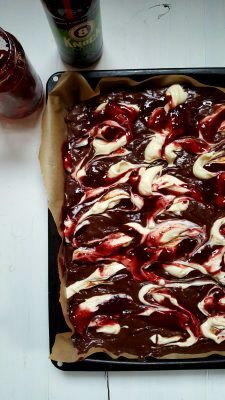 May I present my Irish Stout Blackcurrant Cheesecake Brownies? I’m sure you’ll agree that the work was worth while. The tin that I use for this is an old roasting tin that came with the oven in the cottage. It’s wider and deeper than a regular swiss roll tin, so that you don’t have an overflowing issue. Make sure your greaseproof paper overlaps the tin for just that reason. I use my local beer – Knockmealdown Irish Stout from Eight Degrees Brewing (I also work there, so you can’t get much more local than that! )- along with the blackcurrant jam and cordial that my mother makes every year. Preheat the oven to 180°C (160°C fanbake). Line a rectangular 39cm x 27cm x 3cm tin with greaseproof paper. Make the cheesecake topping: whisk all the ingredients together until well mixed. Make the blackcurrant swirl: using a hand held blender, blitz the jam and cordial together until smooth. Make the brownies: whisk the flour, cocoa, salt and baking powder together in a medium bowl. Gently melt the chocolate and butter together in a large saucepan over a low heat. Take it off the cooker and add the sugar, whisking until smooth. Allow to cool slightly, then whisk in the eggs, vanilla, porter and, finally, the sifted dry ingredients until just blended. Pour into the prepared tin – this is a very runny mixture. Dot the cheesecake topping across the top and drizzle with blackcurrant swirl. Take a knife and swirl with abandon. Bake for 23-25 minutes until set and a skewer inserted into the middle comes out clean. Cool in the tin then cut into 30 large squares and store in an airtight tin. Or bring to the brewery and watch them disappear!